Midfielder Andrew Black insists Edinburgh City won’t let the 6-1 William Hill Scottish Cup defeat at Inverness derail their season. The Citizens exited the competition at the third-round stage following Tuesday night’s replay in the Highlands. Although it was the heaviest loss of the Capital club’s season so far, it is only the fifth time they have succumbed to defeat in 24 outings since the middle of July. Black says the players had no complaints over the final outcome at the Tulloch Caledonian Stadium for what he put down as an “off night” for the whole team. However, with another precious three points up for grabs as the Ladbrokes League Two leaders head for Annan tomorrow, 23-year-old Black says it is important they bounce back at the first time of asking. “We don’t like losing any games but the priority has always been the league,” Black said. “We would have liked to have gone on a good Scottish Cup run but we can now focus entirely on the league and the Irn-Bru Cup. “We always knew it was going to be a tough game up there on Tuesday night. It just so happened most of us had an off night. But a team like Inverness were always going to capitalise on that. We can do much better but they deserved to go through on the night. A Championship club should have enough to see off a team from League Two when at home. “I think everybody expected the gaffer (James McDonaugh) to lose his temper but he just reminded us how well we’ve done so far this season. We’re not going to allow one bad game to halt our progress. We just need to put it behind us and the only way you can do that is go and get a win at the next opportunity. Black welcomed this week’s addition of former Manchester United and Hibs winger Danny Galbraith, who has joined the club until the end of the season. The 28-year-old, who was most recently on the books of York City, has been training with the Ainslie Park outfit for the past few weeks and has done enough to convince McDonaugh he warrants a deal. 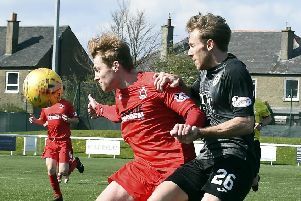 Black believes that despite Galbraith’s limited game time over the past two years, he has all the tools needed to make his mark in Scottish football’s fourth tier. “I think signing Danny typifies where the club is at this moment in time,” he said. “It’s great to bring in a player of Danny’s quality. “Danny has been training for a few weeks now so I’m sure he’s seen the standard. I think he’s bought into everything. I’m sure he’ll be a fantastic addition to the squad. “We’ve got a strong squad so anyone who comes in is capable of stepping in and doing in a job. “We’ve got two massive games coming up against Annan and then Peterhead on Tuesday. We are aiming to take six points so the worst case scenario is we don’t lose them and free up top spot. It would be another big psychological boost for us were we to take maximum points. We are under no illusions it will be tough in what is a really busy month for the club. • Edinburgh City’s Irn-Bru Cup semi-final away at Connah’s Quay Nomads will be played on Saturday, February 19 with a 7.35pm kick-off, live on S4C.